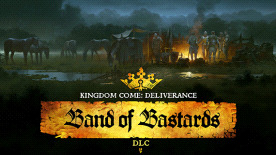 This product requires the base game Kingdom Come: Deliverance. Kingdom Come: Deliverance’s third DLC focuses on combat and minor skirmishes. Sir Radzig's old enemies are pillaging his estates, so he enlists the help of an old acquaintance, Kuno of Rychwald, the leader of an infamous mercenary band. Naturally, they need a guide, and who better for the job than Henry?